Mom and daughter taking on food one bite at a time. 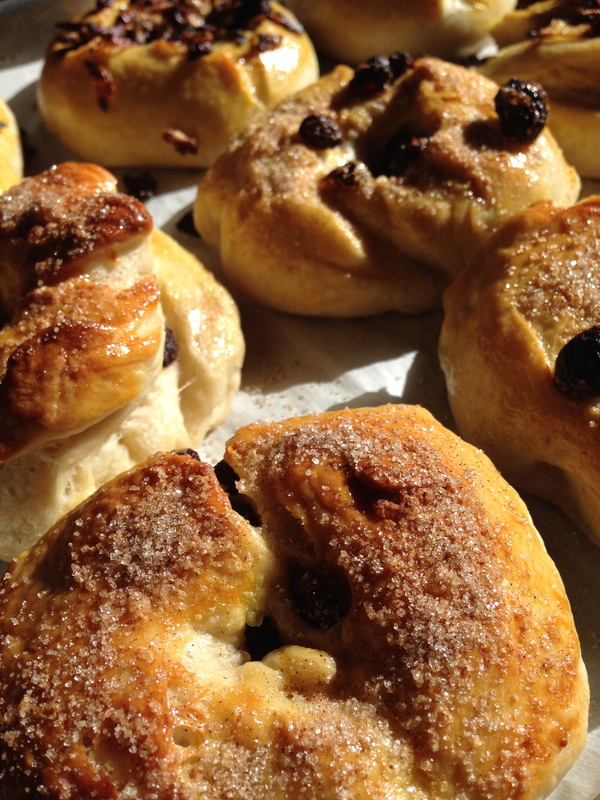 (KERI) Sometimes, you just want to curl up with some flour, sugar, and your oven and make a cozy weekend of it. This was one of those weekends, coupled with an out-of-town guest (who is gladly a tester), some Cincinnati Chili, a yee-haw good time at the National Western Rodeo, and a lip-smacking dinner at Acorn. Wow. That’s a lot of moving, shaking, and eating, ey? It’s all love if ya ask me. – The Cinci Chili: Inspired by my dear friend Todd who recently passed away. He loved life and food and his hometown of Cincinnati. After a recent trip there to celebrate his life, I was intrigued and curious to cook up a pot of this sweet chili and serve it to my friends and family as a 3-way. Or was it 4-way? I don’t know. But it’s damn good. Who can complain about chili over noodles? Here’s the recipe I used. The only change I made was to add beef broth instead of water. A good choice. Next time, I might add more cayenne. Chili, regardless of the sweet, has to have some heat, baby. – The National Western Stock Show and Rodeo: You’re saying, “Rodeo? Really? !” What can I say? A Colorado tradition for over 100 years, my brother and I grew up going every year. The cowboys, the overly-groomed cows and chickens, plus the petting zoo with the freakish goats. Goats are weird. Now, it’s my daughter (and my husband, who pretends he doesn’t want to go) who enjoys the January event. And she loves every second of it, cowgirl that she is. 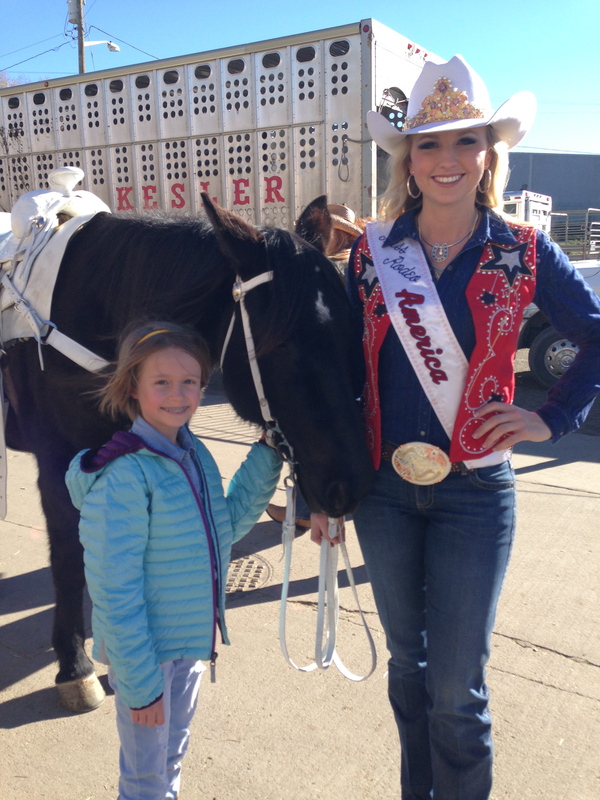 Here she is with Miss Rodeo America (who knew there existed such a title?). – Acorn. A fairly new restaurant in Denver’s hip Source Marketplace. It’s divine, from the kale apple salad I’m going to recreate for dinner tomorrow, to the braised meatballs with grits, and the fried red snapper with farro. Excellent service. Eat there. Be leisurely. And then buy bread from Babette’s and duck sausage from Mondo Food. Now, can we talk about baking?? First, the bagels. The latest issue of the Food Network Magazine contains a recipe for bagels by Ted Allen. Here it was: My invitation to try my hand at that crunchy-on-the-outside-moist-and-doughy-on-the-inside breakfast staple. 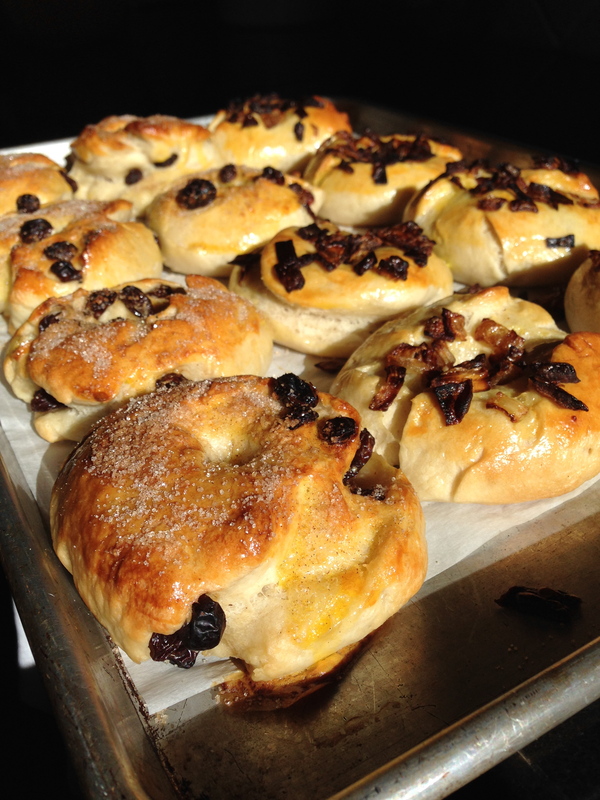 This recipe was specifically for onion bagels, and we made 1/2 dozen according to the directions, and the other 1/2 with raisins and a cinnamon-sugar dusting. The result was wonderful, with my little disk friends looking adorable with their imperfections, and smelling like a NYC bagel house. The recipe’s base calls for a mashed Yukon Gold potato, honey, and olive oil. That combination wasn’t exactly the best backdrop for the raisin cinnamon bagel…Not bad…but next time I’d change the olive oil to canola to keep it neutral. Sky’s the limit on the number of filling combos. And bagels are so versatile. We know this. But sometimes we take them for granted and need a little reminder. We served ours as a lunch sandwich with scrambled eggs, lox, and dill. Happy people around our table, and that is the best review ever. Excellent fun with the punching, the kneading, the boiling, and the baking. Yes, this is my idea of a good time. I’m completely smitten (and slightly obsessed) with Deb Perelman’s The Smitten Kitchen. 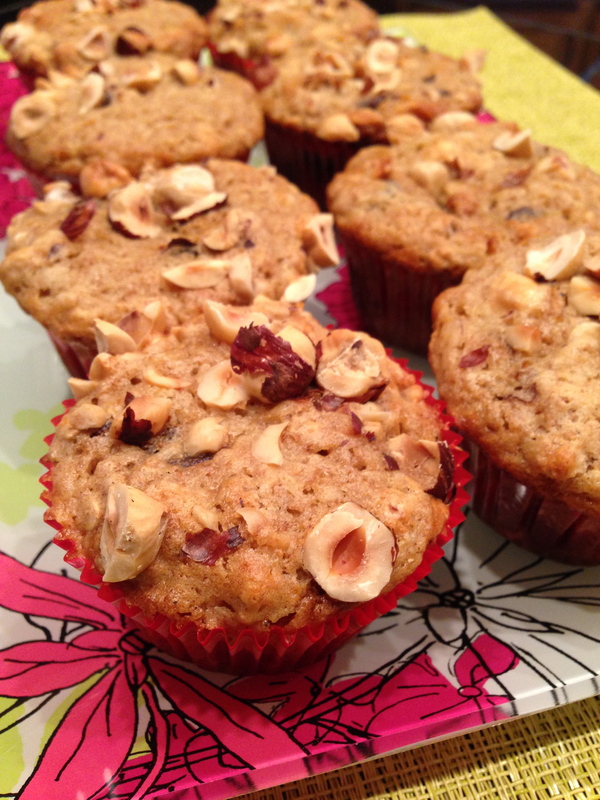 Pear Hazelnut Muffins are the current post, tweaked from Whole Grain Mornings (which I cannot wait to buy). I read the recipe and cocked my head thinking about shredded pears, dark chocolate, and hazelnuts baking in a sea of oats, buttermilk, and spices. I really couldn’t NOT try it. What emerged from the oven was a tasty combination with a wonderfully overwhelming number of textures. The nuts, the oats, the shredded fruit, and the creamy chocolate bobbing up here and there for attention. Giddyup. They aren’t overly sweet (Daddy Bite suggested that in fact, they were not sweet enough, but then his tooth is wired for sugar topped with more sugar), which I love. What a fabulous combination. I did use 1/4 teaspoon of each cardamom and cinnamon. I think I’d take Deb’s advice and only do the cinnamon next time. Cardamom, though I lust for it’s exotic aroma, was a little overpowering in this delicate muffin. I’m toting these to the office tomorrow to hopefully promote some smiles and satisfied tummies after a three-day weekend. What’s better than a weekend of cooking, good friends and family, the rodeo, and a couple of best baked goods? Not much, my friends, not much. Go snuggle up with yours, and your oven. Mash the potato. Bring 2 1/2 quarts water to a boil in a large pot. Add the potato and cook until tender, 20 to 25 minutes. Remove the potato, reserving the cooking water. When cool enough to handle, peel the potato and mash in a medium bowl until smooth, adding a few drops of the cooking water, if needed. Make the dough. Stir the olive oil and honey into the mashed potato. Mix the flour, 2 1/2 teaspoons salt and the yeast in the bowl of a stand mixer fitted with the paddle attachment. Knead the dough. Turn the dough out onto a lightly floured surface. Knead by hand until the dough is smooth and bounces back when pressed, about 5 minutes. Let it rest. Drizzle a little olive oil into a large bowl. Add the dough and turn to coat it with oil. Cover the bowl with a damp dishcloth and set aside in a warm spot until the dough is doubled in size, 1 1/2 to 2 hours. Cook the onion. While the dough rises, melt the butter in a large skillet over low heat; add the onion and cook until transparent and soft but not browned, 20 to 30 minutes. Season with 1/2 teaspoon salt and set aside. Form the bagels. Punch down the dough. Form into a log, then cut into 12 equal pieces. Roll each piece into a tight ball and set on a parchment-lined baking sheet; cover with a damp cloth and let rise 30 minutes. Make a hole in the center of each ball with your thumbs. Stretch and turn the ring until the hole is about 2 inches wide. Return to the baking sheet, cover with a damp cloth and let rise 20 more minutes. Preheat the oven to 450 degrees F.
Boil the bagels. Bring the remaining reserved potato cooking water to a boil. Carefully drop the bagels into the water, a few at a time, and cook 30 seconds. Flip the bagels with a slotted spoon and cook 30 more seconds. Set the bagels on a rack to drain, then return to the parchment-lined baking sheet. Bake the bagels. Transfer the baking sheet to the oven; bake until the bagels start to brown, about 10 minutes. Beat the egg with 1 tablespoon water; brush the mixture on the bagels and top with the sauteed onion. Continue baking until golden, 10 to 15 more minutes. Let cool 15 minutes before serving. Heat oven to 425°F. Butter a standard 12-cup muffin tin or line it with papers. Grate pears on the large holes of a boxed grater into a large bowl. You should have about 1 cup grated pears. Stir in melted butter, sugar, buttermilk, eggs and vanilla until combined. In a separate bowl, stir together the oats, flours, baking soda, baking powder, spices, salt, chocolate and all but 1/2 cup coarsely chopped hazelnuts. Gently fold this dry ingredient mixture into the wet batter until just combined; do not overmix. 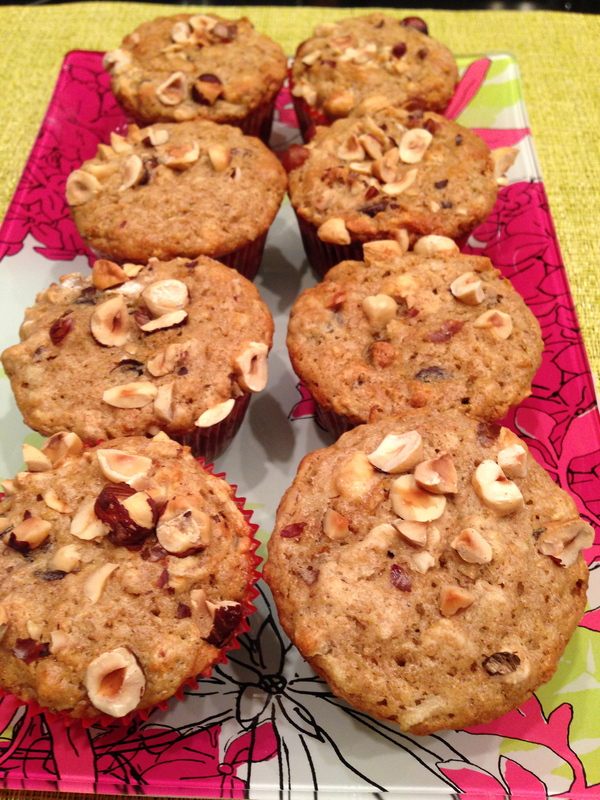 Fill muffin cups almost up to the top and sprinkle with the reserved 1/2 cup hazelnuts. Place muffins in oven and immediately reduce the heat to 375°F. Bake for 20 to 25 minutes, or until the tops are golden brown and a toothpick inserted into the center of muffins comes out batter-free. Cool muffins in pans for 10 minutes, then transfer to a cooling rack. Muffins will keep for 2 days at room temperature in an airtight container. This entry was posted in Breakfast, Dessert. Bookmark the permalink. Enter your email address to follow Two Bites Kitchen and receive notifications of new posts by email.